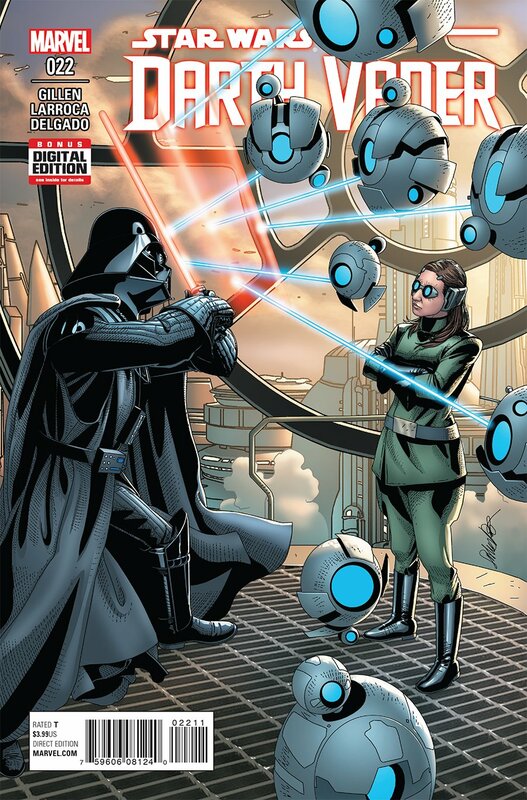 We are now in the final stretch of Darth Vader series – only three issues remain. As this issue opens near Kuat where the Super Star Destroyer Executor is being completed, we witness Triple Zero, Bee Tee and Black Krrsantan delivering Aphra to the Empire to await for Vader. Triple Zero promises her a dark and short future, but Aphra is quick on her feet and uses loophole in droids’ programming to elicit their help. Back on one of Cylo’s whale ships, Tulon Voidgazer is preparing her rancor cyborg to battle Vader. This is basically experiment for her. 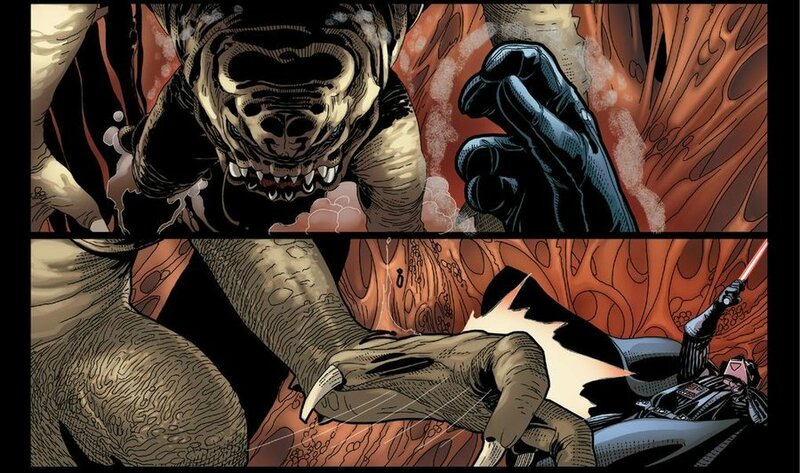 While Vader naturally hold his own, rancor is enhanced so much that it can even withstand Vader’s powerful Force choke. For all her posturing, Tulon is not the sharpest tool in the shed – she basically tells Vader how the rancor cyborg works. Talk about the villains who like to explain their would-be victim their eeeeviiil plan. Vader is not just preternaturally powerful, he is also very smart and uses her blubbering to end the rancor in a jiffy. Vader tells her that she might understand a lot, but she doesn’t understand the Force. Tulon answers that she trusts in science, not his superstition. You have to ask yourself at this point, how stupid you have to be to see what Vader can do and still brush it off? On another part of the ship, Cylo and Morit discuss the death of rancor and Tulon’s inevitable demise. They drop out of hyperspace near the Executor. Cylo orders activation of Voidgazer’s protocols and abandonment of the ship. Vader turns Tulon’s droids on her and she is defeated. As she lies dying, she tells Vader that she will live on and that she used to be stationed on Tagge’s ship. 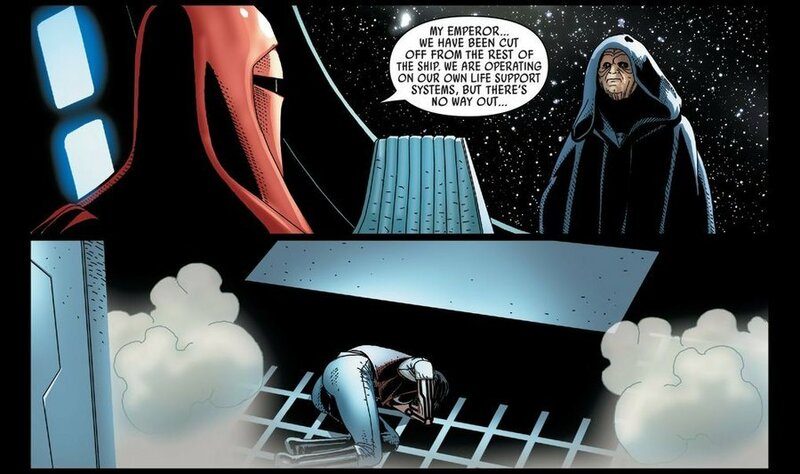 The Executor weapons and controls are disabled and the crew gassed – Tagge in the middle of giving the Emperor his report. The Royal Guard are the only ones left standing as they have their own life support systems. Vader ends Tulon, but cannot take control over the whale ship. Cylo and Morit watch from the escape pods as the ship is hurtling towards the Executor to separate it from the shipyard. Cylo wants Executor for himself and his cyborgs. He believes Darth Vader is dead. Can you say overconfident? I cannot wait to see this guy destroyed. It is clear now that the rush to the end will cover destruction of cyborgs. As I stated in the past, I got really bored with them as they lack that little ‘something’ that makes great characters. Compare them to Inspector Thanoth and you will see what I mean. That being said, I am getting vicious satisfaction from their slow destruction. The nerve of Cylo in trying to take over the Executor! There is such a thing as being too clever for your own good. Larocca’s art is stunning as always. I love how he draws environments (space, inside of whale ship) and action. Since the beginning of the comic I was amazed how he is able to convey emotion and thoughts of his masked protagonist. Edgar Delgado’s colors perfectly compliment Larocca’s art. At this point, we have to recognize that there are very few storylines unconnected to the cyborgs left. One is Doctor Aphra’s fate. The other concerns murderbots. While Aphra is drugged with the rest of the crew, the droids will be free to help Vader. I am interested to see how they fare against Cylo and friends. Vader can also expect a helping hand from the Royal Guard. Since the beginning of the comic, Gillen did a great job capturing our favorite villain, his cunning, his intellect, his power and ambition. Did I want to see more of that and less of cyborgs? Yes. But I have a feeling that Gillen still has a few surprises up his sleeves and, frankly, now that ending is in sight, I cannot wait to see what they are. I am hoping that he will find to let Aphra live. She is a great new character and she did get an offer for help from Leia in Star Wars comic. I also want Cylo’s downfall to be as brutal as possible. Remember Vader’s scene on Hoth from the novel Twilight Company? Like that. 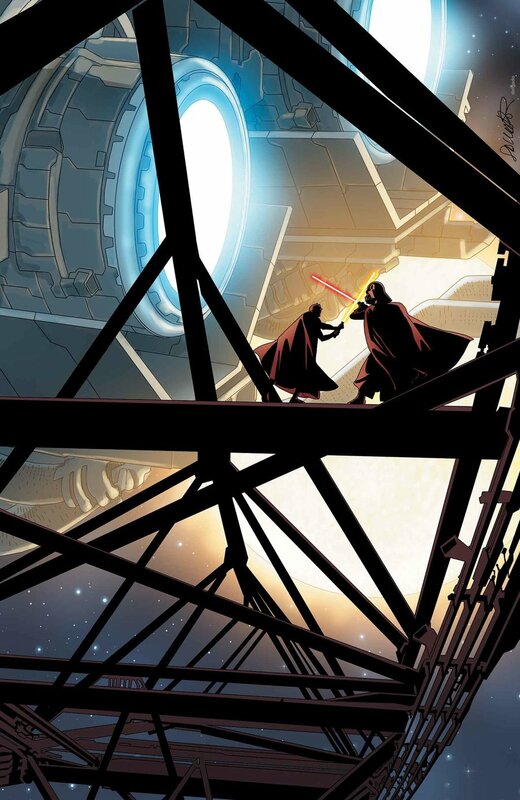 What are you hoping to see in the last three issues of Darth Vader? It seems that Morit is next in line to die.